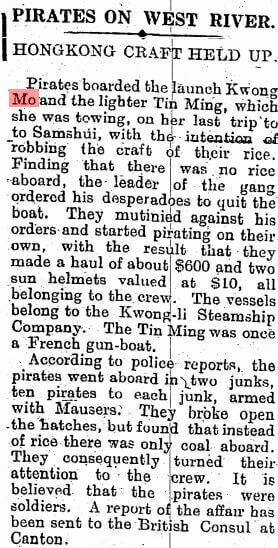 Stephen Davies has sent a newspaper report from August 1922 featuring a launch and lighter of the Kung Lee (Kwong-li) Steamship Company (公利輪船有限公司). Stephen adds, The company was very short-lived. It was founded on 23 February 1922 and was dissolved four and a half years later on 22 October 1926. Kung Lee were operating in the relatively slow river freight business with small steam vessels (steam launches) that they used for towing lighters, which would have been what carried the cargo. They’re the ancestors of the modern river trade cargo boats and a lot of HK to Guangdong hinterland traffic was shifted this way, since the cargo could go straight from the ship working midstream into the lighter and then be towed to its destination wherever that was in the Pearl River Delta area – or the lighter could be loaded from a godown on the waterfront (probably most common) and then towed wherever. The towboat didn’t have to wait for the lighter to unload but could just return with either an empty lighter (not usual) or one already loaded for the backhaul.